FoodThoughtsOfaChefWannabe: Who is hungry for homemade RAVIOLI?!? 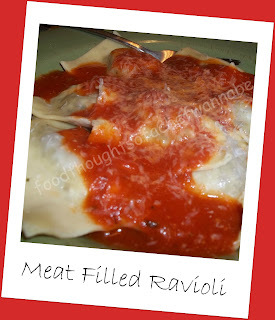 Who is hungry for homemade RAVIOLI?!? Well it is St. Patty's Day and where am I? Blogging for my faithful readers We aren't doing anything tonight, and just had corned beef, cabbage, potatoes and carrots. Was delish. So I wanted to take the time to attempt to organize my thoughts and get this posted for you beautiful people! I apologize it has taken so long to get this post up. Just have been busy and by the time I am home and able, I am so tired!! Anyway, I promised it this weekend, and so here we go with it!! Ok we are going to start with the filling. I made a meat filling this time. Making a cheese filling is just as easy and I will include both recipes..
Brown hamburger with all seasonings until cooking thoroughly. Drain any grease and let cool. When cooled add in 2 eggs, shredded mozz and mix completely. Put mixture into a food processor and process until it is finely ground. Transfer to a bowl and let cool You can also then stir in 1/2 cup of ricotta cheese if you like. Totally optional though. I used a dough hook and mixed it in my stand mixer. You can do it by hand and knead for 5-7 min after the mixture is completely mixed. Combine mixture. As soon as you can reach into the mixture and squeeze it and it stays together, it is done. From this point you will knead it for 5-7 minutes. It might even take a wee bit longer. When the dough is smooth, let it rest 15 minutes covered. To roll out sheets of dough. Take your ball of dough and cut it into 6 equal parts. Take each piece and smoosh into a very, VERY flat disc. Run it through the pasta roller starting on 1 and ended at number 7. Roll one sheet at a time, then make your ravioli or your dough will dry out. I cut my sheets of dough into manageable sizes, about 8 or so inches long. Put 3 dollops of filling on the sheet of pasta. Using a pastry brush and water or beaten egg, brush around the entire perimeter and inbetween dollops. SEALING is SO important! Lay a sheet over it and start using your fingers to seal up the ravioli. Cut it apart when you are done. After reading this, I think you just need to go watch a You Tube video on it! My explanation is a hot mess!!! Depending on how big or small you make them you will get 25-45 out of a batch of dough! I laid mine out on a parchment lined cookie sheet in a single layer, added parchment over the top and put another layer then I wrapped them well and froze them until I used them. I had leftovers that I left frozen and put in Ziploc bags for future use! To cook them, bring a pot of salted water to a boil and drop them in, they take about 2-3 minutes to cook, remove with spider or slotted spoon and let drain on paper towel or in a colander!! Serve!! I made a quick marinara, and alfredo sauce for these. My husband isn't a huge fan of red sauce, thus alfredo for him. Grate some fresh parm on top and go to town!! Make sure, one more time, you get those ravioli's sealed or they will be water logged! Like I said, I realize this is kind of all over the place. I apologize, I have these moments, and have no excuse for them! Follow the recipes, you can't mess it up, I promise!! Did I say first thing I was going to "organize my thoughts". I almost just spewed green beer out of my nose. Cheers friends! PS. I just realized, my filling is for a double batch of dough. So make double the dough or half the filling. OR, do both and with the leftover dough do this......cut it into noodles for soups! Dry or freeze, bag and pop them in the freezer!